Authentic in taste, Dippin’ Flavors’ diverse offering of ice cream flavor bases and fruit purees are made of the highest quality flavor and fruit ingredients. 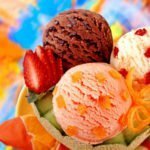 Using good quality flavor bases and fruit purees when making ice cream is essential to provide the highest quality ice cream or other frozen dessert for your customers. Low quality flavor bases only allow flavors you don’t want to show up in your ice cream.